Love the performers in the T stations. This cellist was quite the delight. I didn’t win. But apparently my merit badge is pretty awesome. All kidding aside, thanks to Doc Pop for selecting me as his runner up. Thanks to Chris Brogan, Jimmy Gardner, Jonny Goldstein, and everyone that dug the rap. 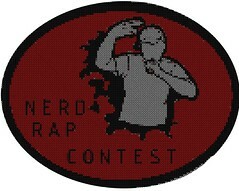 Do I have a future making nerdy raps or raps of any kind for that matter? Maybe. Maybe not. But it is apparent that I have a future in merit badge making. Check out the vid. So I’m going to keep this short and sweet. I entered. This is my rap…BLUE TEAM REPRESENT! I’m on version 27 you’re still rollin in beta. Travis Morrison Hellfighters came around to the black cat after Travis’ big move to NYC. Travis Morrison will always hold a place in my music collection with the Dismemberment Plan – but his influence over the music of the Hellfighters holds steady with his lyrical way of singing, pop sensibility, tech-pop-soul-funk-progressive keyboard/piano riffs, and his herky-jerky antics. Again – doing a little testing with the Exilim and learned a very important lesson – stay the hell away from the speakers! Yeah – so the bass blew out the audio and it’s all overmodulated – but it has its moments. Take it for what it’s worth. 5 songs. P.S. Travis Morrison Hellfighters are all on twitter. Check it out over at www.travismorrison.com. Or simply follow Travis here. Gerry T, The Kroosh, and I stopped in for some handmade local vodka and some tunage at the Avid Tent at SXSW.